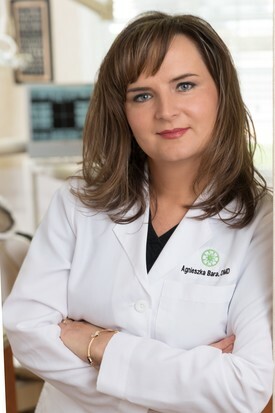 Dr. Agnieszka Bara is a highly skilled dentist, who graduated first in her class from UNIVERSITY OF MEDICINE AND DENTISTRY OF NEW JERSEY. She earned numerous prestigious awards, including the Omicron Kappa Upsilon Excellence Award, and the Alpha Omega National Award. She continued her education by completing an optional Residency program at Robert Wood Johnson University Hospital in New Brunswick, where she was welcomed as a courtesy staff member. Dr. Bara firmly believes in the importance of continuing education and staying on top of new advances in technology. She has completed over 1500 hours of continuing education and received the honor of becoming a Master of the Academy of General Dentistry in 2009. Dr. Bara's mission is to deliver the best dental care possible to her family of patients while taking the time to listen, explain and care. Dr. Bara firmly believes in gentle dentistry, encourages patient questions and enjoys sharing knowledge with her patients. Dr. Bara speaks English and Polish fluently. At our modern facility we treat people, not just teeth! Coming to our office you can expect to be treated like family! Now, you can enjoy the latest high-tech dental solutions from Dr. Bara and her carefully chosen team of dental professionals and get the undivided attention that you deserve. We are proud to provide you with the best modern dentistry has to offer inlcluding Invisalign (Clear Braces), All on 4 (Teeth in a Day) implant supported immediate restorations, Cerec 3D same day porcelain crowns and restorations, Sedation Dentistry and much more. In today’s busy world we take the time to listen, explain, and care. Focusing on the unigue needs of our patients we can help you achieve a healthier, brighter and better looking smiles in just a few appointments--not months or years! We are very excited Dr. Bara was recently voted New Jersey's Favorite Kids Docs 2016 which will be published in December's issue of Family magazine! Dr. Bara lives in Scotch Plains, NJ with her husband of 20 years, Tom and their 19 year old son Tommy. Ouside of the office Dr. Bara enjoys spending time with her family, reading and cooking.